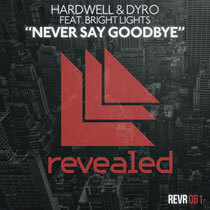 Hardwell recently released his collaboration with Dyro, ‘Never Say Goodbye’ featuring Bright Lights, on his own imprint Revealed Recordings. As the official soundtrack to Hardwell’s Miami after-movie, ‘Never Say Goodbye’ has already been a favourite during his set at Ultra Music Festival. The track matches Bright Lights' vocals with the energy that the artists have shown across clubland. The song opens up with drums that lead the listener to the first break where Bright Lights' vocals pierce through for an engaging, introspective sequence. Melodies are soon introduced and ascend to the forefront of the soundscape while the looming build takes shape. Drums, synths, and vocals all come together for a launch into the drop that takes the song into a melody-driven flight. It’s out now, check it out below.